President Elizabeth Stroble’s base pay compared to faculty base pay was lower than the average of comparable institutions in the 2011 academic year. In 2010, human-resources firm Mercer Consulting performed a study to review compensation for administration and faculty. The Journal used the universities specified in the faculty study for comparable institutions as well as comparable institutions as determined by the Chronicle of Higher education. The administrative study was requested but was not provided by the university by time of publication. 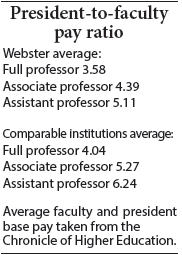 However, these ratios do not take into consideration the bonus pay awarded to university presidents. In 2011 Stroble was awarded a total of $75,000 in bonus pay on top of her $304,790 base salary, as well as another $115, 485 in other benefits. Bonuses are awarded to the president by the Board of Trustees on a yearly basis. Stroble ranks 35th out of the 46 universities compared in base pay, and 24th in total compensation. Stroble was one of the 15 university presidents to receive bonus pay. Dan Hellinger, professor of political science, said this gap between administrative and faculty pay is happening nationwide. “In this respect the university is following a trend that almost everybody is noticing in increasing the gap between the wealthiest in our society and ordinary wage workers,” Hellinger said. Federal tax documents acquired by The Journal show Stroble’s base salary in 2012 to be $312,712 with a bonus of $85,000. Stroble also received $106,844 in other benefits that year. Management professor Jim Brasfield said the awarding of bonuses to college administration is not a new concept, but both Brasfield and Hellinger agreed that the university’s Board of Trustees needs to explain how they decide on bonuses. “The board should tell us what the metrics are for awarding bonuses, especially since they are imposing merit pay on the faculty,” Hellinger said. Brasfield said bonuses are generally given to reinforce an administrator’s goal to increase the institution’s profit. But for a non-profit such as Webster University, he said this should not be an incentive. Brasfield said that even if bonuses are to be given out, the system of rewarding the administrators for university success is flawed. “To just say a couple of administrators should get extra pay for some success – but not the people that contributed to that – is not a good way to have a reward system,” Brasfield said. The tax documents show Stroble – along with four others – were awarded at-risk compensation, a form of bonus pay to entice administrators to stay with the university. Hellinger said this form of bonus pay is unnecessary because every employee could be replaced. Brasfield echoed this idea and said the university should just stay competitive with their base salary as opposed to offering large bonuses every year. Faculty members will now receive raises determined by merit rather than “across the board"